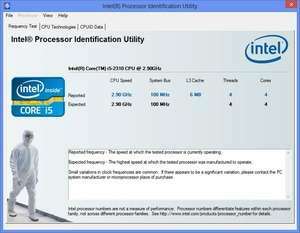 Intel Chipset Identification Utility is a small utility which displays information about your Intel CPU. The main interface of the identification utility lists all Intel CPUs, their core CPU speeds, system bus, L3 cache, thread and core counts. The next page of Intel Chipset Identification Utility includes details about the technology that the processor is compatible with including Rapid Storage Technology, Matrix Storage Manager or Intel Chipset Software Installation Utility. Do note that running this program on Windows 8 is hit-and-miss. Version 6.0 is a freeware program which does not have restrictions and it's free so it doesn't cost anything. For security reasons, you should also check out the Intel Chipset Identification Utility download at LO4D.com which includes virus and malware tests. Additional screenshots of this application download may be available, too.